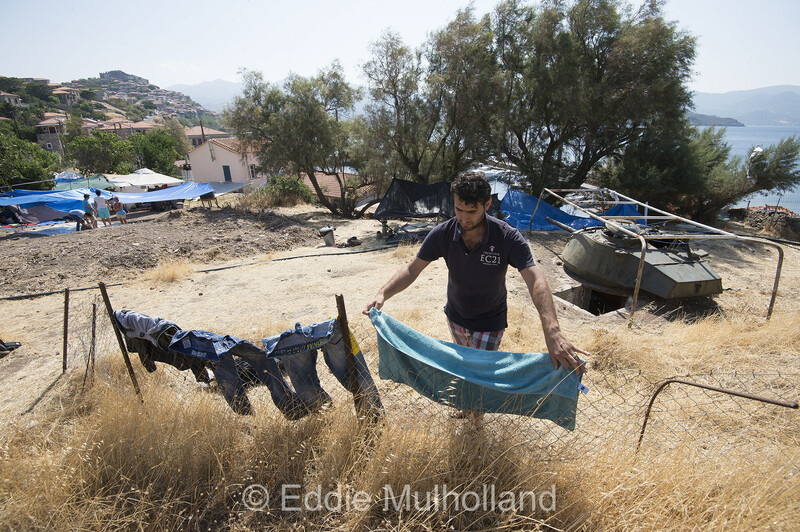 Lesbos-The Refugee crisis | Mulholland's mumbles. 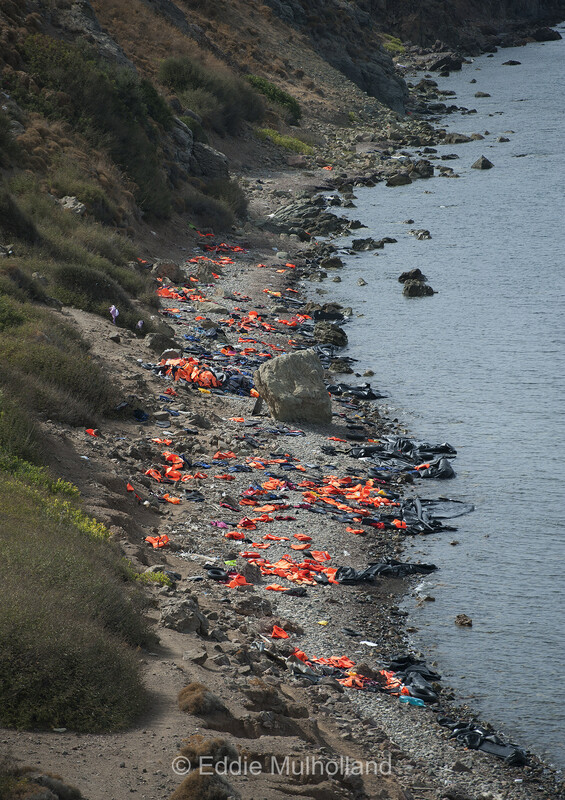 The death of Aylan Kurdi or, more specifically, the photographs of his body washed up on a beach in Bodrum, Turkey seemed to cause a seismic shift in public attitude towards the plight of those risking all to escape their own countries for life in Europe. 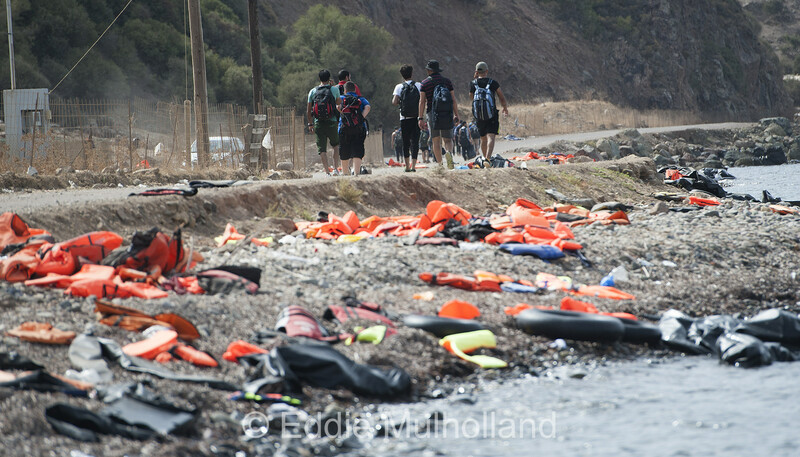 I was despatchedby The Daily Telegraph to Turkey in the aftermath of that event and then onto the Greek Island of Lesbos. 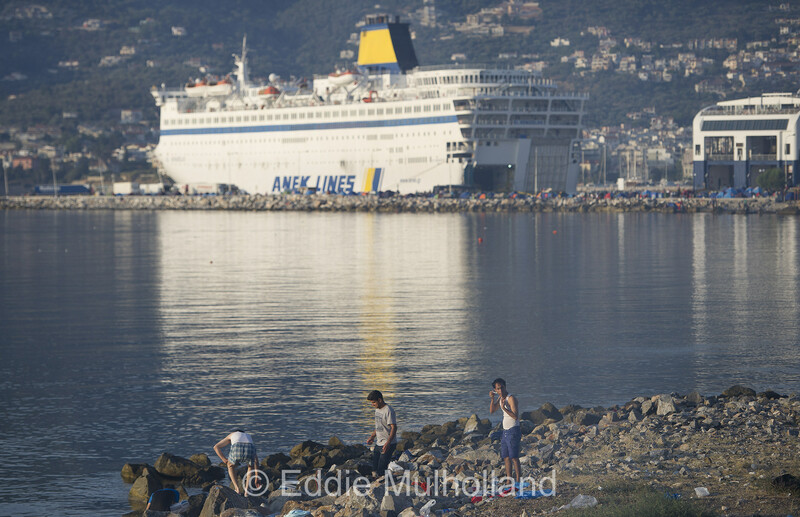 Where a backlog in processing onward travel documents had caused a bottleneck of somewhere in the region of 20,000 refugees, all keen to reach the Greek mainland and continue their journey to a new home. 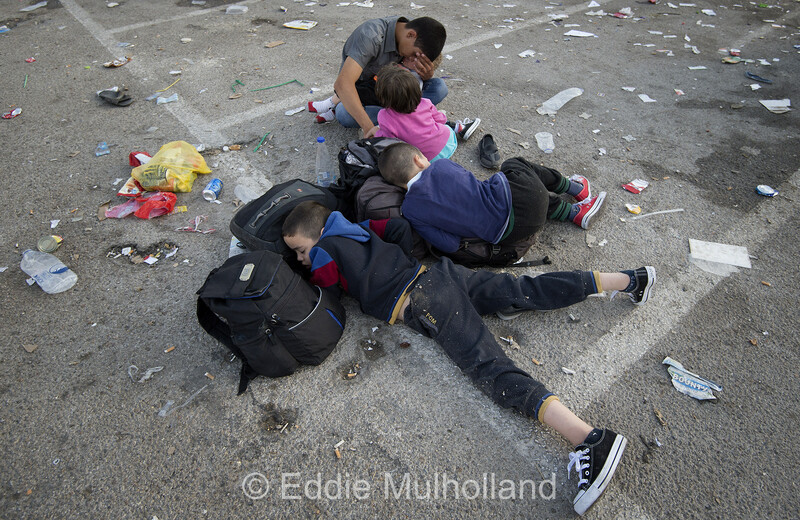 More often than not we were told that their intended destination was Germany. 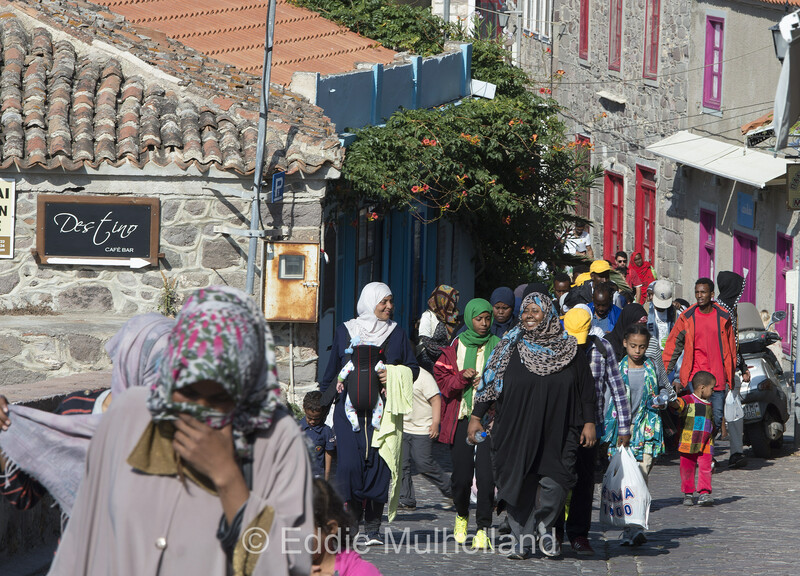 Myself and a colleague drove from Bodrum to Ayvalik and caught the ferry to Lesbos. 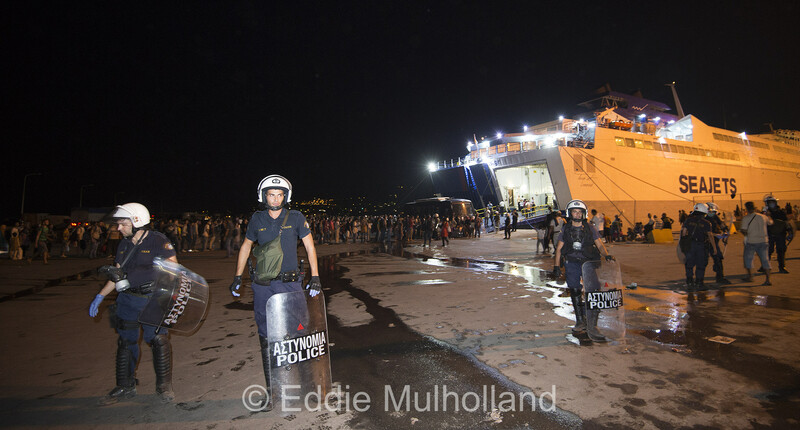 As we arrived in the port of Mytilene on Lesbos it became obvious things were getting out of control. 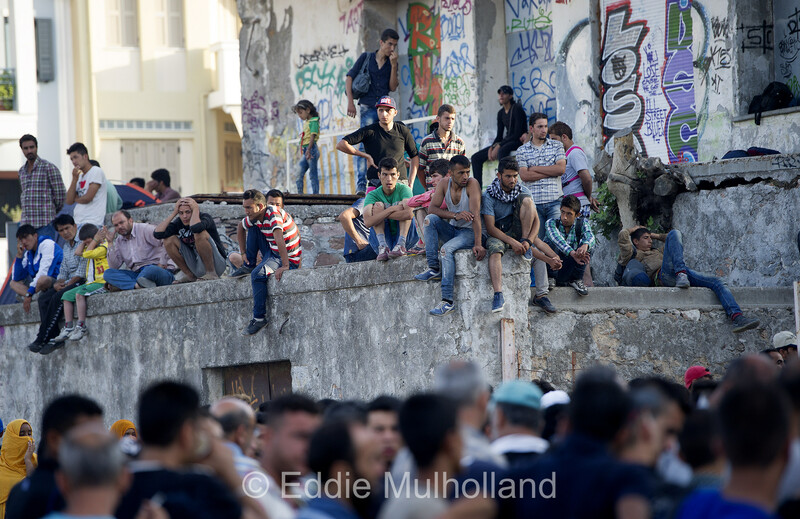 There was an angry demo taking place with lots of young men demanding their travel documents. 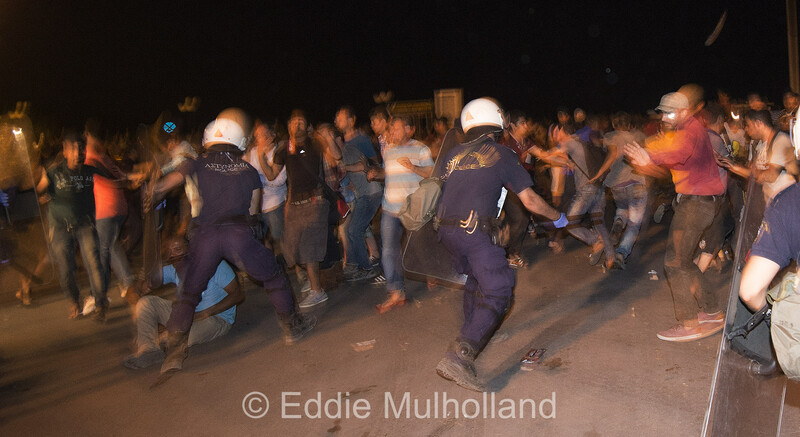 The riot police were out and the whole place had the feel that it was near boiling point. We skirted through the edge of the demo and booked into a hotel right across the road from the dock where we had landed. We dumped our luggage and went straight back outside. 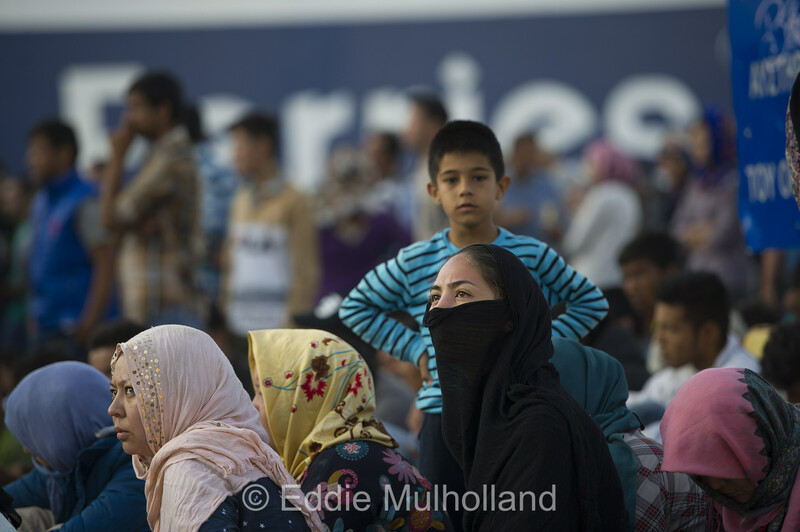 The demonstrators had been chanting and wandering up and down the streets outside the port when we arrived but had now returned to the makeshift camp in the terminal, where a stand-off was in place with the baton and shield wielding police. Almost immediately, there was a police charge and I found myself in exactly the wrong place between the charging police and the now retreating protesters. Two police with raised batons came hurtling towards me. Having nowhere to run, I stood my ground, camera held aloft and shouted as loud as I could “HANG ON HANG ON “. 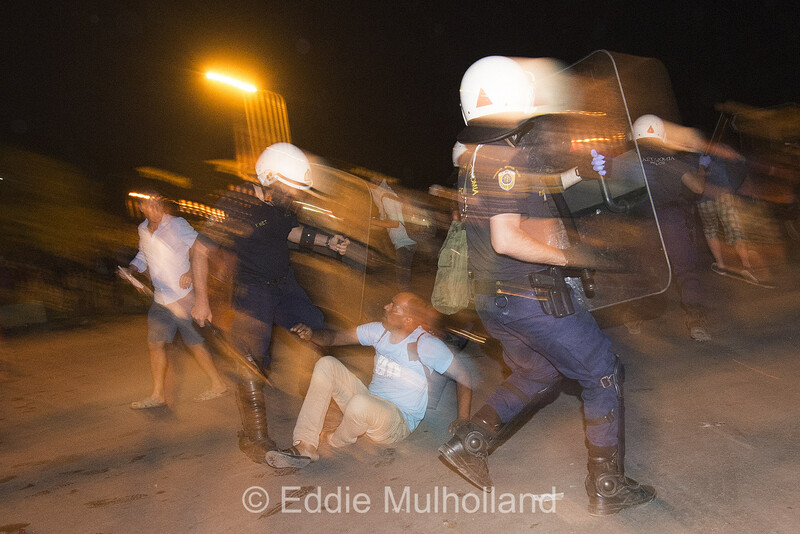 Thankfully, the two officers parted around me and chased after the demonstrators. It was a far cry from an out and out riot. 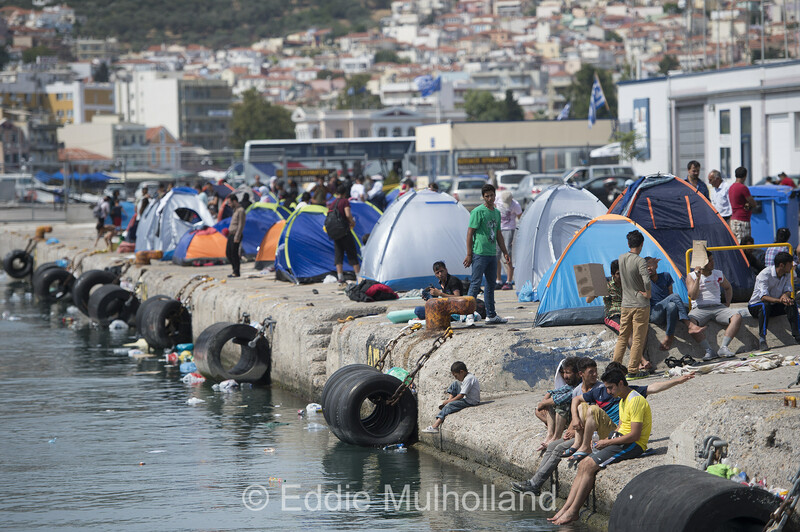 The refugees, mainly Syrian, would regroup and the police would chase after them, belting those that were too slow. 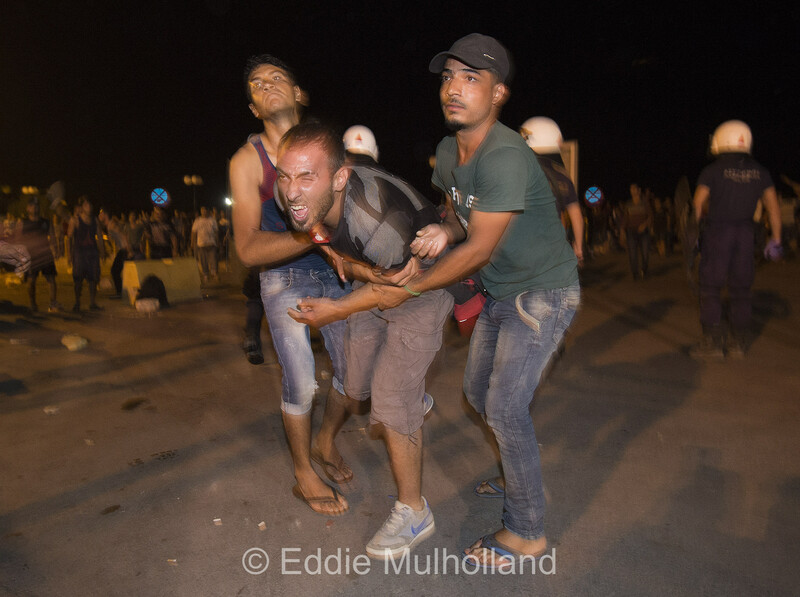 A few were injured and received first aid from other demonstrators. 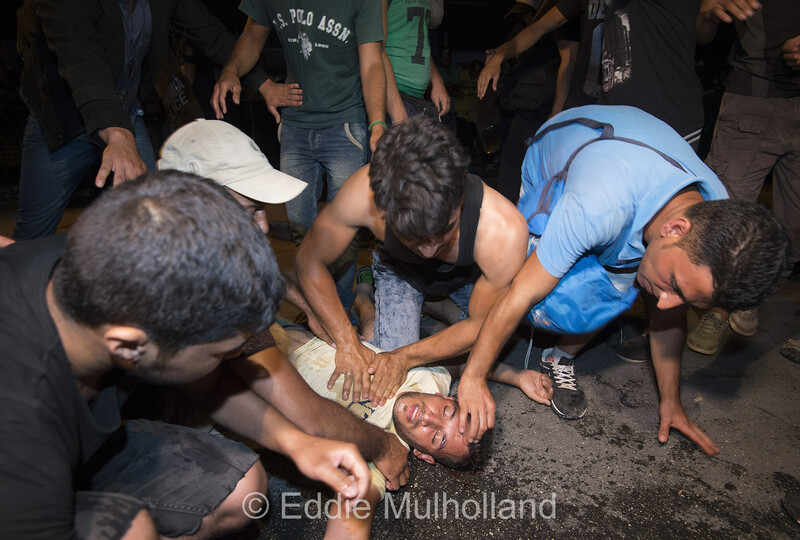 In between the charges, we were beseiged by demonstrators begging us to help them. They didn’t want money just someone, anyone to fix the mess they were in. 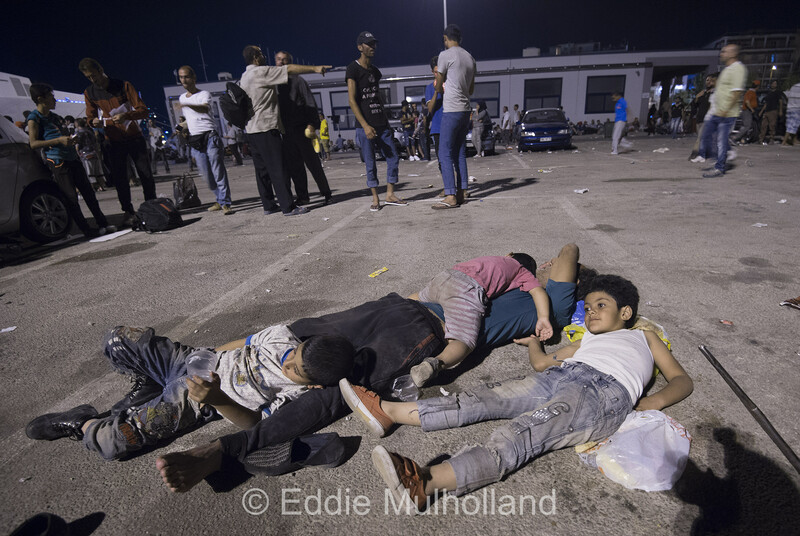 Essentially, the problem was that there were thousands of people in the port and each one was waiting to be issued with a piece of paper which would allow them to buy a ticket and board the ferry for mainland Greece. There were only two government officials working short hours to issue these bits of paper. The queues were momentous and people were essentially living next to the issuing office with no access to toilet facilities or fresh water and on funds that were dwindling away. Funds which they would need for the rest of their journeys. The 35ºC heat wasn’t helping matters either. When things calmed down for the evening we headed back to the hotel. At first light we went back to the port. The queues had already formed for that day’s short issuing window. 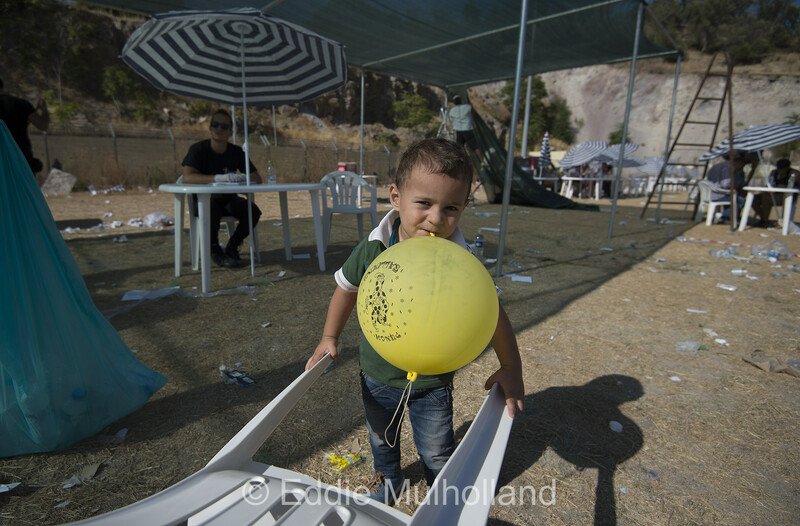 Those lucky enough to have tents and those who had been sleeping with their families on nothing more than the floor were stirring and getting ready to face another day in the heat with little food or water. Everyone we spoke to told the same story, all they wanted was that little piece of paper. 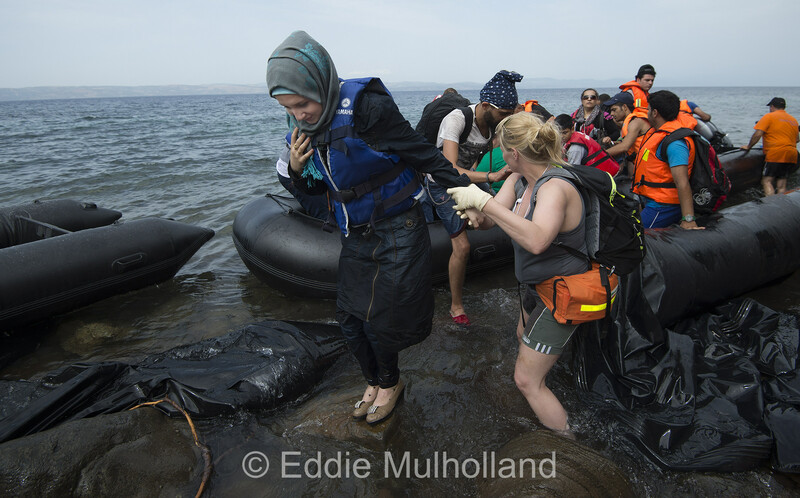 It seemed ridiculous that such a desperate situation could be caused by obvious incompetence. 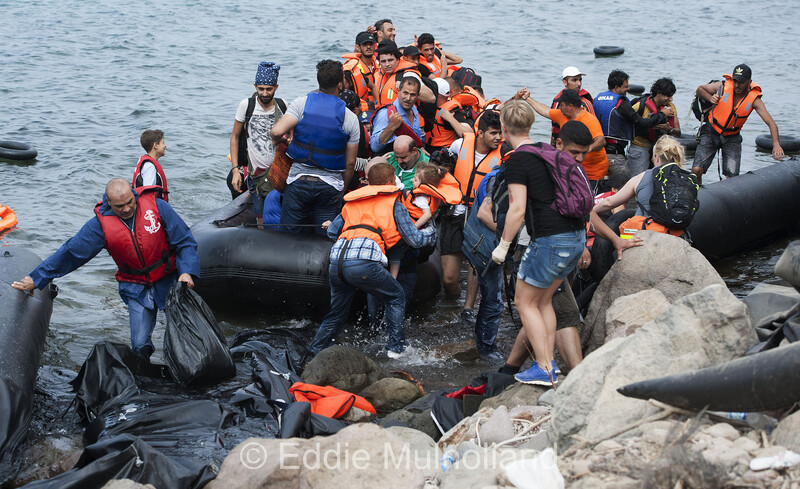 Everyone seemed agreed that all that was required was more officials working longer hours to get the backlog cleared, and that the backlog was getting worse because refugees were arriving by dinghy at the rate of about 1,000 per day on the north coast of the island, near a town called Molivos. 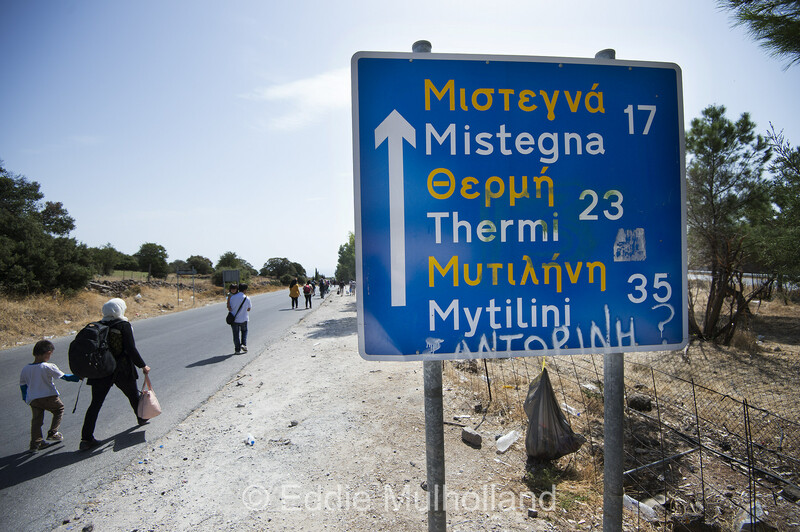 We set off to Molivos the next day, a distance of about 60km. 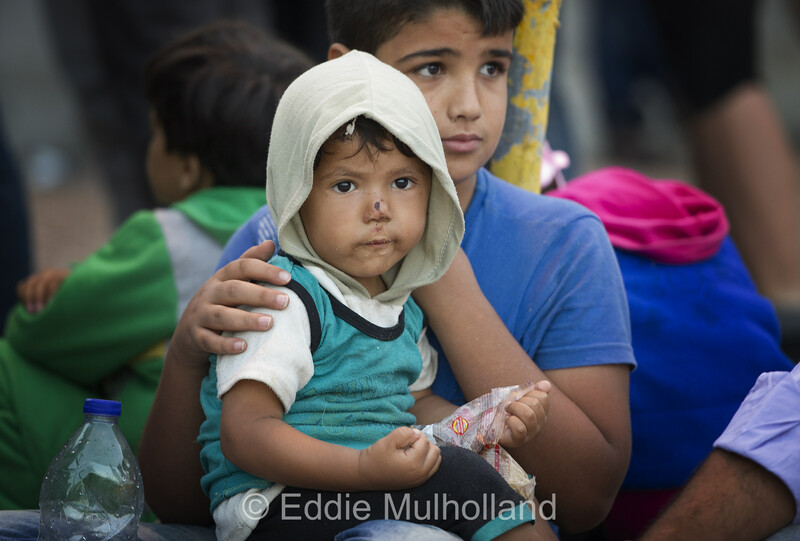 On the way, we saw hundreds of refugees making the journey to Mytilene by foot. There were no buses and locals, and indeed ourselves, had been told that giving lifts would be treated as ‘trafficking’. Everyone we passed was still smiling from the joy of finally being in Europe. It was a long walk in blistering heat but they considered themselves lucky. At least they had survived the most perilous part of their journey, the sea. Later, that afternoon, we were on the coast road as a dinghy came in. 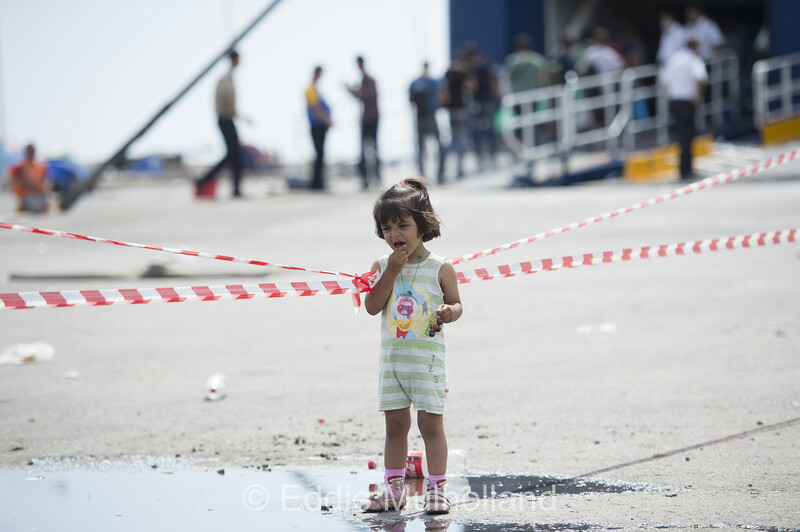 We raced down to the landing site and watched the first steps of these latest arrivals on European soil. That evening we witnessed the Coastguard delivering a boatful of refugees rescued from their sinking dinghies and the following morning watched as they left the pretty town of Moilivos and were finally bussed to Mytilene, it turned out one of the only ways to jump the registration queue was to be ‘lucky’ enough to almost drown, those picked up by the Coastguard get registered. We followed them back and, after getting lost a few times, found the new ‘Registration’ facility that had been erected the evening before. It was almost deserted. 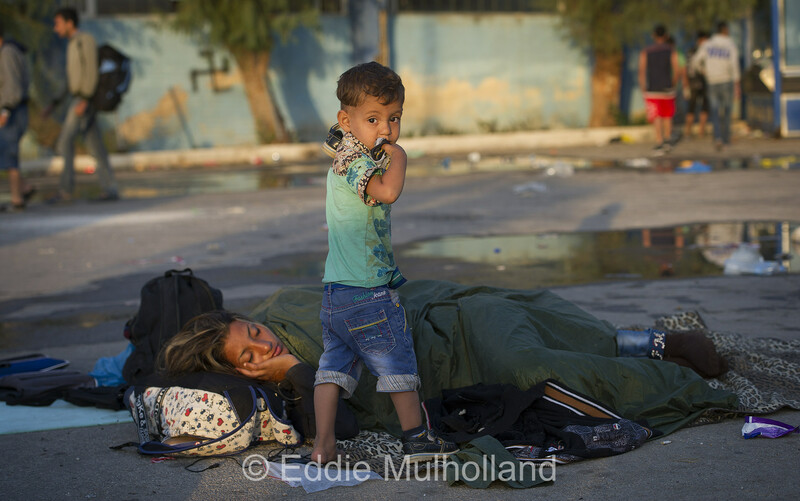 The UNHCR and the Greeks had been hard at it for 18 hours and had broken the back of the backlog. They had registered over 12,000 people. It wasn’t the registration that was the problem they explained. 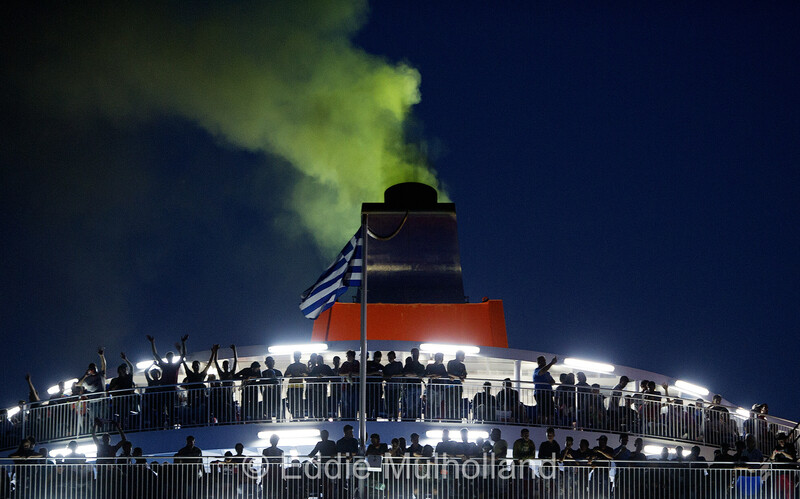 The problem was that there were simply not enough spaces on the ferries during the tourist season. 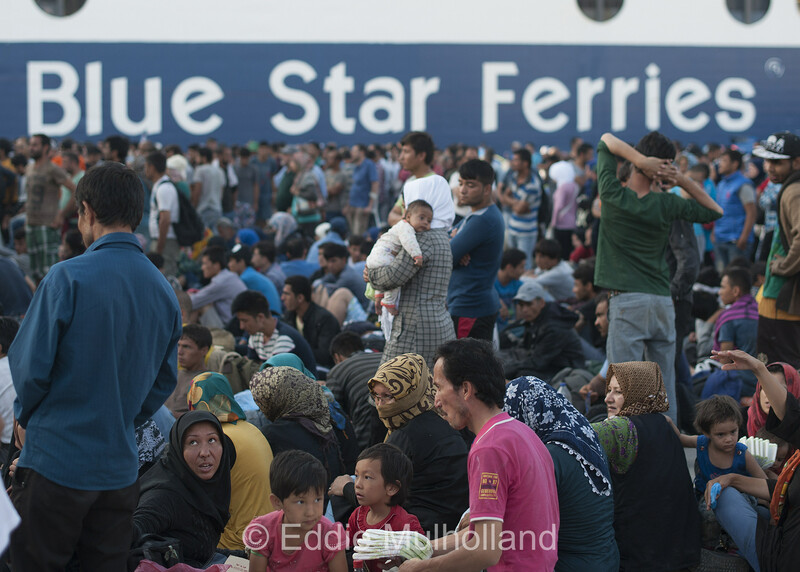 Now that had ended the space had freed up and they were able to shift large numbers of people at speed off the island. 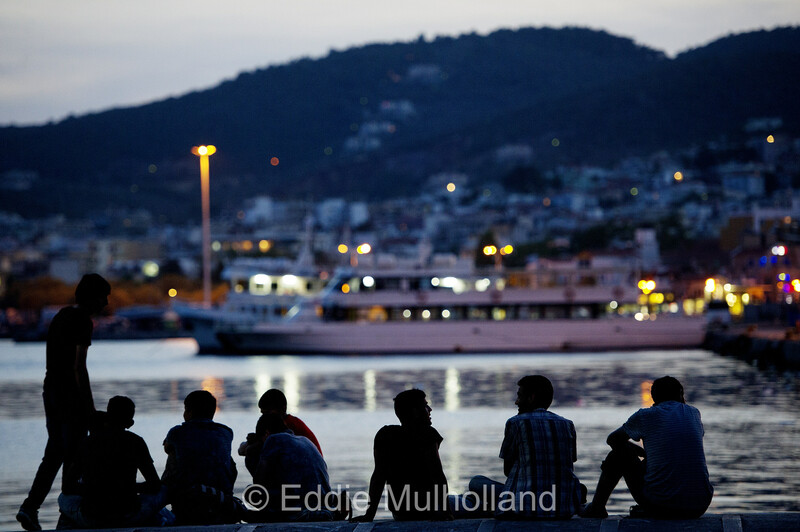 I went back to the port that evening and watched as people waved from packed ferries, on their way at last. The port was a lot quieter. I visited the port one more time the following day, before flying home. It was transformed. 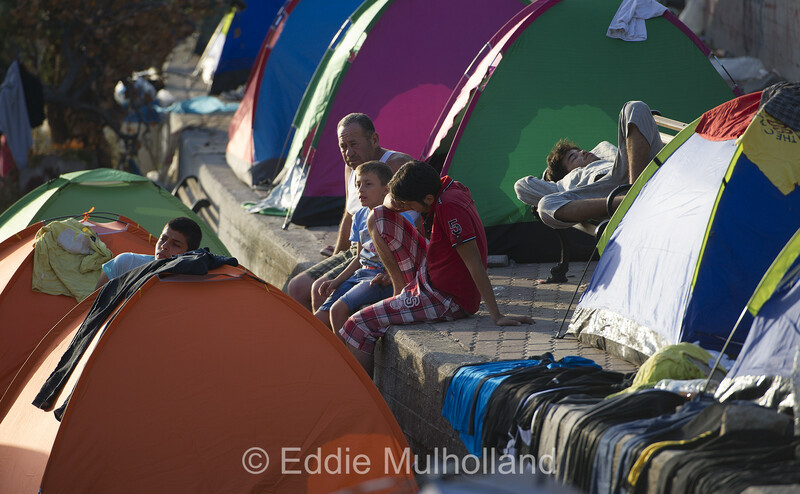 There were still people camped out but the numbers had been slashed. There was order to replace the chaos. 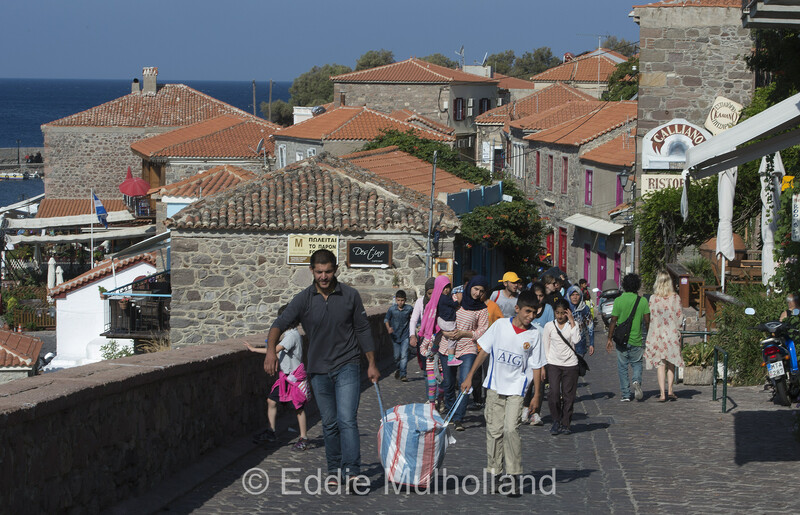 As long as the authories can keep that flow to the mainland there will be some semblance of normality returning to Lesbos. 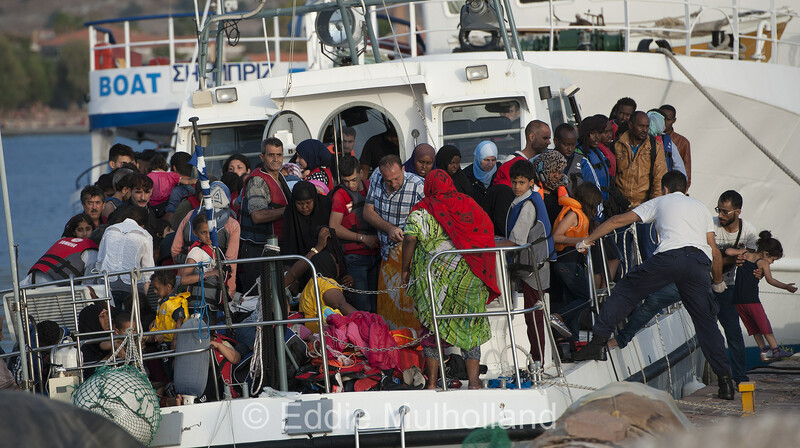 However, with the same numbers arriving on the north of the island everyday, they will have to keep on top of it or it will return to the desperate conditions we first witnessed in no time at all. 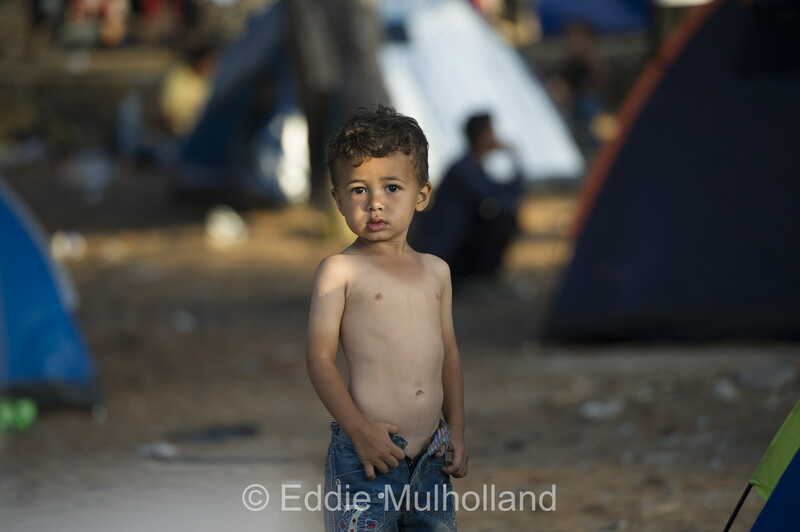 This entry was posted in Uncategorized and tagged #europe, #greece, #humanitariancrisis, #photojournalism, #pressphotography, #refugees, #Syria, #turkey, #unhcr. Bookmark the permalink.